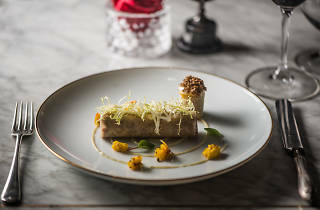 Helmed by head chef Arron Rhodes, a man who has worked at Michelin starred establishments and ones that have made the World’s 50 Best list, the venue is British furniture maestro Timothy Oulton’s first-ever restaurant. It’s hard to miss on, you guessed it, Gough Street, what with the 1940s diving suit inside a tank of piranhas that sits by the entrance. Given Oulton’s involvement, it’s no surprise that the restaurant area is replete with vintage touches. The most fabulous is a wall completely covered in white feathers, which looks heavenly. 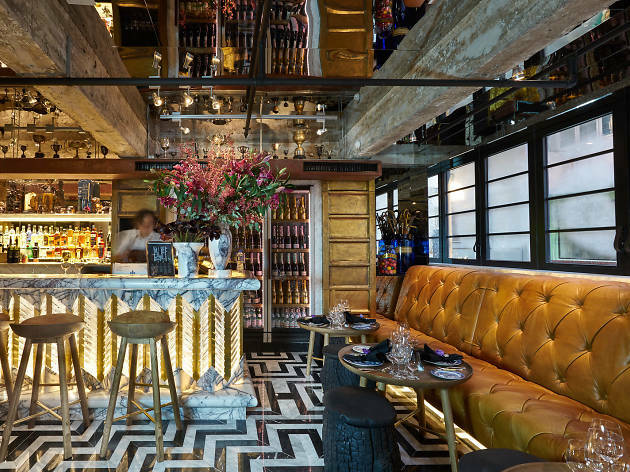 We’re seated in a booth and examine the menu, which is heavy on modern British cuisine with nods to chef Rhodes’ experience working in southeast Asia and Peru, and our hopes are high. For starters, we opt for Peruvian corn and beef tartar. The sweetness of the corn is boosted by a chicha morada infusion while the citrus notes from the leche de tigre jazz up the accompanying warm avocado. Toastiness comes in the form of popped kaniwa grains. 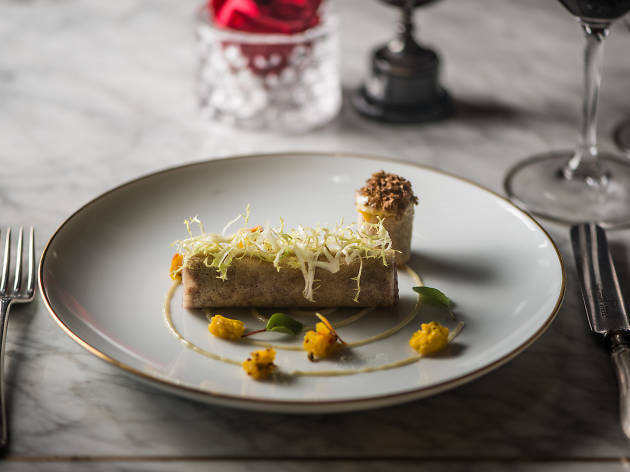 The creamy, tender tartar is presented in a crunchy, cigar-shaped pastry and the piccalilli on the side adds a sweet and sour kick. A great start. For mains, we begin with the handmade gnocchi, which is perfectly al dente. The saltiness of the six-month matured comte cheese sauce cuts through the earthiness of the fresh herbs also present, as do the vinegary pickled potatoes. Next to arrive is the fish of the day: wild Scottish salmon served with Cornish mussels, a light curry and coconut emulsion and sweet dried tomato. The salmon is superbly flaky and sports a briny flavour that farmed salmon can never rival. The curry and coconut emulsion adds some Thai flair and our side of roast carrots with orange and ewe milk ricotta and gremolata is as flavoursome as it is colourful. Things slip a little come the desserts. The chocolate fondant with Peruvian cacao, salted caramel, tonka bean and opaline tuile is rich and indulgent. It’s enjoyable but pedestrian compared to the preceding dishes. The Icelandic skyr dessert (yoghurt, basically) with macerated berries, toasted oat granola, white chocolate crumble and local honey is reasonable but doesn’t taste of white chocolate as much as it does cream. Almost everything is stellar at Gough’s on Gough. 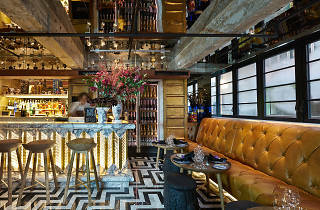 The food is top notch, the plating gorgeous, the service warm and attentive, and the interior design is stunning. With a little tweaking of the dessert options this could be another decorated establishment for chef Rhodes to consider home.